Take a journey deep into the mythical jungle where you will find the King of the tribe, the strong and brave defender of the sacred jewels – the Golden Monkey. Enter into this ancient world where you could win amazing rewards of up to 250x your stake from the master himself. Hurry up and click to play online slots now! Having a strong focus on free spins make sure to watch for golden and purple free spin symbols, if you get 3 there’s a free spin in the pot for you, with 4 you can get the free spin and 1,000 coins and with 5 you could get a free spin PLUS 5,000 coins! With incredible features such as the sticky wilds, countdown wilds, free spins and the ultimate Golden Monkey bonus this 5 reel game is sure to get that jungle juice flowing with a minimum stake of only 25p and a maximum of £250.00. 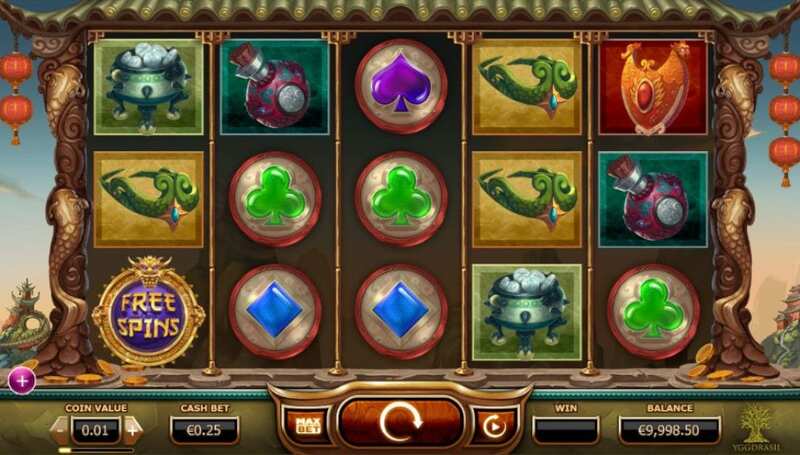 Relatively new to the online slots world Yggdrasil should not be underestimated. In the time since their arrival, they have yet to disappoint, having won multiple awards including Slot Provider of the Year two years running with their fresh and advanced designs. Other games they have introduced including Reef Run and Double Dragons have been a great success, with The Legend of the Golden Monkey being their first animal themed title it is sure to follow suit. Yggdrasil Gaming is a new developer here on Wizard Slots but we truly love some of their slot game offerings. Jam-packed full of features that you will go bananas for, this slot game is sure to wow you with an incredible 96% Return to player (RTP). For a list of high RTP slots, check this list. Ancient patterns and an oriental backdrop enhance the theme of the game whilst decorative gold pillars separate the five reels. Look out for symbols of golden pots that can get you 250x your stake when you spin in 5, silver pots of coins that can get you 200x and the purple scroll which will give you 150x. Other symbols that you may come across include shields, potion bottles, snake headdress, ruby hearts, green clubs, blue diamonds and purple spades. Sticky Wilds – if you land one of these in your winning line they will stay in place for as long as you keep winning. Countdown Wilds – featuring on the third reel, a number will be revealed which will remain there for that amount of spins stated. Golden Monkey Feature – this can appear at any stage of the game, it changes a symbol in favour of forming a winning combo. The last symbol to look out for is the treasure chest; affecting the fifth reel. During the base games, you have a chance to win 1,000 coins and 1 free spin, with the free spin rounds having the possibility of winning 1,000 coins and 2 free spins. 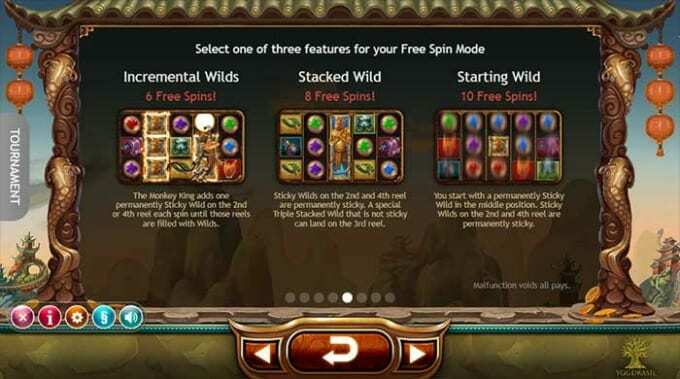 This slot game provides plenty of opportunities to make a winning, with the crazy combo of wilds and chances of free spins. Release your inner wild side and join the ancient tale of the Legend of the Golden Monkey now.